Something bizarre happens to Reilly when he returns from Ireland 1896 to the library. He feels different. Almost like he's not the same person ... or worse. Maybe that's how everyone feels after a first kiss. Maybe. But what if that first kiss is his last? Unexplained flashbacks haunt him, until one day he finds himself trapped and alone in a cavernous room under the prehistoric ruins of Stonehenge. 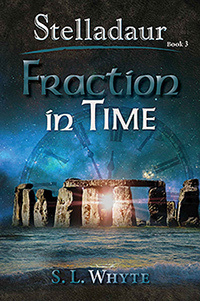 When three familiar statues deliver to him the Stelladaur Scrolls, Reilly must learn the secret of keeping history from repeating itself, or all he knows and loves will vanish forever. Even before it exists.